A movie based on a book I have never read but if the book is anything like the movie adaptation of Ready Player One, it is absolutely one of the greatest nerd stories ever. 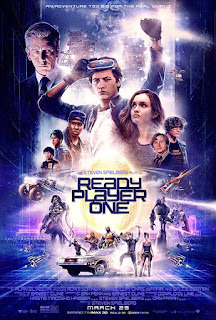 Cast: Tye Sheridan, Olivia Cooke, Ben Mendelsohn, Lena Waithe, T.J. Miller, Mark Rylance, Phillip Zhao, Win Morisaki, Simon Pegg, Hannah John-Kamen. Pros: I loved that the story revolved around a world where you can enter a virtual reality called the Oasis and try to beat levels so that when you succeed you become a trillionaire in the real world and become the new owner. Ready Player One had so many references to old movies, games and other pop culture from the 80s to the present time. Just that in general is what made this film amazing, you see old characters you played with and movies you've seen, it literally made the inner child inside me jump with glee. I was so entranced by Ready Player One that my heart couldn't stop beating in scenes and my hands were shaking after it was over. I cannot remember the last time I had a smile from ear to ear in such a long time throughout most of the whole film. The story, the actors, the world in Oasis was brilliant and beautiful at the same time. I will repeat this again but the story from a non-reader's perspective seemed to keep a pace that kept you on the edge of your seat and I never felt bored or negative about any scene. Seeing the main character go through struggles in finding the next clue and seeking help from friends made it just like a video game and that enthralled me. Cons: I don't have any cons that I can think of but to put at least one down I will mention that a couple friends of mine that did read the book felt like the film didn't go into too much detail and was rushed because the books go into more depth. I personally didn't feel that way and to fall more in love with this great story I will be ordering the book to read. I highly urge, encourage and recommend you see Ready Player One -- 100%, do not miss out on this fantastic movie! I am planning on seeing it again to find more easter eggs that I've missed. By the end of this year, this will definitely be in my Top 5 movies of 2018 list. Do not miss out on this soon to be classic, this will become a must-own when it's available for bluray/Dvd.